Eating nutritious, delicious food does not have to cost a lot of money. In fact, you can feed not only yourself – but also your family for less than $10 a day. The following recipes are part of my first $10 Food Day series. I am featuring four recipes (breakfast, lunch, dinner, and a snack), enough to feed four people for less than 10 dollars – for the entire day. I shopped at a regular, non-discount grocery store. I did not use coupons, but rather looked for in-store deals. For example, I found a pound of pasta for $.88. I bought the cheapest available ingredient – which is often the generic brand. I chose food items that were cheapest per unit. For example, I bought a bag of onions instead of buying one individual onion. Major cost savings here. I used some of my favorite cheap food items to come up with this menu: Oatmeal, lentils, pasta, and popcorn. 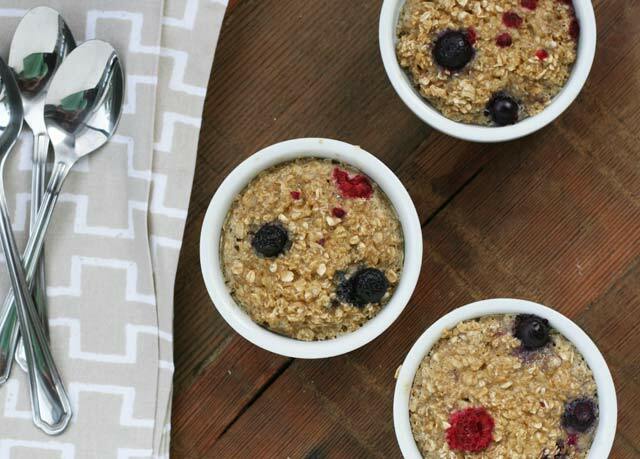 This berry baked oatmeal costs $1.47 for four servings. Get the recipe here. 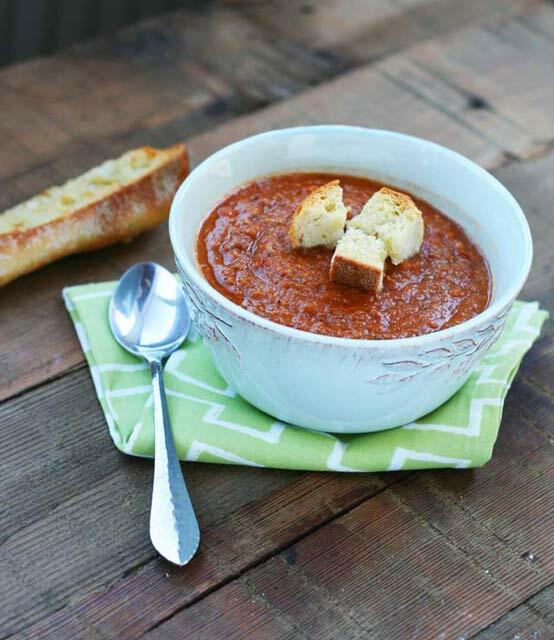 This hearty soup costs just $2.53 for four bowls. Get the recipe here. Easily the best tomato sauce I’ve ever eaten. And it’s made with only three ingredients! Just $3.31 for four servings. Get the recipe here. This sea salt popcorn is delicious on its own, but feel free to add some spices or homemade popcorn sprinkle for a little something extra. Just 23 cents for one huge bowl of popcorn. Get the recipe here. All four recipes cost just $7.53. There is even some wiggle room to account for drinks, bread, fresh fruit and vegetables, or other food. 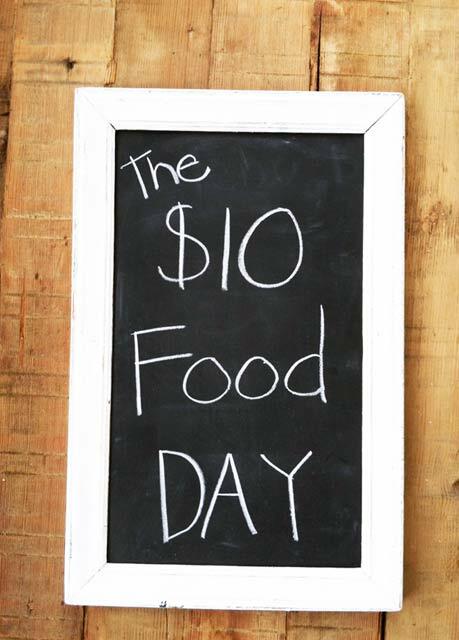 More $10 Food Day Recipes! First Time Visiting Cheap Recipe Blog? I’m so glad you’re here! Please take some time to look around and discover more cheap recipes, leave a comment, and like my Facebook page so we can keep in touch! How do you feed your family on a budget? What are your some of your favorite ultra cheap meals? Wow Haley!! What a great website and a wonderful idea. The receipes look sooo delicious!! I’m definetly going to try some. keep up the good work. What a fantastic idea for a series; I look forward to following it, along with the rest of your fabulous blog. To eat cheaply in our family, we totally use in-store deals and some coupons, and I try to plan 1-2 meals a week purely from what we already have in the freezer, fridge, or pantry. Plus, we eat seasonal produce…which is typically cheaper because of excess supply. Great post! Can’t wait to try that soup! Just ran across your $10 Food day series. First off…awesome idea and second….GENIUS. Thanks for sharing and even if the meals aren’t followed to a “T”, you still give the rest of us the foundation for following your plan. Grocery bills are doing nothing but going up, up, up these days. More of us need to figure out how to eat cheaper and smarter like you. Great idea but the food is not filling enough to satisfy an average person. Good thing the grand total came to $7.53 then!